DONATE NOW to help ensure families don't miss out this summer. 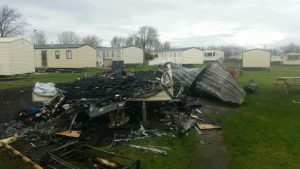 In the early hours of Wednesday 29 April 2017, one of our two caravans situated at Craig Tara in Ayr was badly damaged by a fire that destroyed a neighbouring caravan. Thankfully, nobody was injured. The family staying in our caravan was evacuated and returned home safely the following day. We would like to thank the staff at the holiday park and emergency services for their swift actions and professionalism. 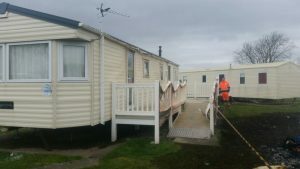 It seems likely that our caravan will be beyond repair, and whilst it was insured, the process of putting in a claim will naturally take time. We are therefore facing a situation where families, some of whom had already been awarded a break, will now miss out. That is why we are asking our supporters for financial help now so that we can take immediate action and ensure that as few families as possible are affected. Craig Tara is a particularly popular site for the families we help. Set in a beautiful location, it offers stunning views over the Firth of Clyde and, of course, it has a sandy beach! For us to lose the opportunity to provide as many breaks as planned at this location would mean that children are denied the pleasure of building their first sandcastle or flying their first kite. It would mean that parents and carers are denied a renewed sense of hope and happy memories to cherish. We are determined to make sure this doesn’t happen. We know how important the breaks we offer are to families, and our caravans play a vital role in enabling us to do that. You can help us to continue this important work by donating now. Some families can only ever dream of a break away together. With your help we can continue to make dreams come true. We were delighted by the speed and generosity of the response to our Emergency Caravan Appeal. 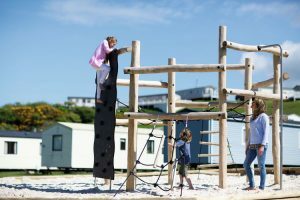 We are pleased to report that as a result we were able to find alternative accommodation for every family that had been promised a break at Craig Tara. Our thanks to everybody who made a donation. We recently received confirmation from our insurers that the caravan is beyond repair and will need replacing. Unfortunately the payout will most likely come too late to impact on this season but that does mean we will have a brand new caravan ready to welcome families in 2018.